Trai Forrester's DVD Verification and DVD Authoring Services best serve your studio with the right experience, capability and tools. Many clients have commented over the years how Trai can always be so positive and seeming free of stress, even during production mobilizations involving the replication of multi-million run discs (example: Music Box Films' - The Girl With The Dragon Tattoo, The Girl Who Played With Fire, The Girl Who Kicked The Hornets' Nest), but that's because years of experience and an armada of tools allow Trai to always know the state of your DVD or Blu-ray images. And when the 'crisis' arises, Trai knows what to do to help keep the project on track. Please call 800-213-2297, or 610-924-9204, or email Trai if you have questions on these capabilities in relation to a current or upcoming DVD or Blu-ray project and to put an end to needless worry and risk for you and your clients, when it comes time to submit for replication. EclipseSuite® Replication Industry DVD Image Analysis Tools. No person or entity should be submitting your DVD images on DLT, hard drive, FTP or even on lowly DVD-R for replication for you unless they first pass Eclipse ImageAnalysis. How are they going to know if what they're submitting will not have issues at the replication facility? Sonic Scenarist® "Hollywood's DVD Authoring System"
Trai Forrester's New Constellation Technologies, was licensed by The DVD Forum for Part III - VIDEO SPECIFICATIONS for 7 years during his development of the DVDAfterEdit program. 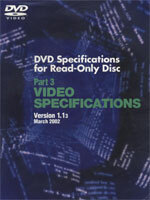 Trai has the entire DVD Specification Book Library to consult when needed for your projects. Many times these volumes have proven crucial to help Trai solve some of the toughest DVD troubleshooting jobs. Trai was responsible for bringing the DVDAfterEdit utility to DVD authors on all continents and led the DVDAfterEdit development team (Trai sold his 50% interest in the DVDAfterEdit joint venture in November, 2005 - 6 months after launching DVDVerification.com). Isn't it good to know that the guy you're thinking about hiring to help with your 'DVD needs' has years of experience and knows the DVD specifications inside and out? Many times, clients have wondered how Trai could possibly have taken even complicated projects, apply the fixes and re-output a bullet-proof DDP file set for replication in record time. Now you know. Trai has said "DVD Reauthor Pro is one of the good reasons to acquire Scenarist". Pre-testing with the above tools allows us to know precisely which sections of the DVD to test (along with the standard areas to check) - resulting in the most accurate DVD Check Disc and DVD-R Release Candidate DVD testing in the industry. The player bank includes 32 Blu-ray playback devices, for testing standard DVD's as well as for Blu-ray and 3D Blu-ray discs.